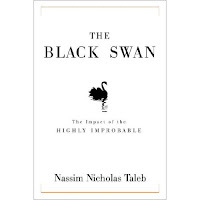 Book Review of The Black Swan written by Nassim Nicholas Taleb The Black Swan is one of the most fascinating, most challenging and most thought-prevoking books I have ever read. Let me point out, before going any further, that my interest in this book started as a trendy thing, because it seems this is a popular book to read by investors and traders. However, that quickly faded, and I became very interested in the actual material and arguments that Taleb was making. One of the best things about this book is that every page is a challenge (for me, at least). It isn’t challenging to follow (in fact, it’s very simple), but the material is just personally challenging, because it will make you completely change your way of approaching a topic without you even thinking about it. Taleb is a Wharton-trained quant with trading floor experience. Now, he promotes himself as more philosopher than finance guru, although, rumor has it he’s still pretty involved in investing activities. He also advises corporations, as well as the U.S. government, including DOD and the State Department. Overall, this is a great read, but it’s also one of those books that even if you don’t have the same mindset as the author, the way he presents the material in the text can make you take a completely different approach to considering various issues that we face everyday. My recommendation for this book has nothing to do with the fact that it has become a fad within investor circles and the financial/hedge fund world. My recommendation for The Black Swan is based on its ability to transcend traditional and conventional ways of thinking, while at the same time, stay entertaining as the subject matter gets deeper and deeper.